A team of astronomers led by Caltech has discovered a giant swirling disk of gas 10 billion light-years away—a galaxy-in-the-making that is actively being fed cool primordial gas tracing back to the Big Bang. Using the Caltech-designed and -built Cosmic Web Imager (CWI) at Palomar Observatory, the researchers were able to image the protogalaxy and found that it is connected to a filament of the intergalactic medium, the cosmic web made of diffuse gas that crisscrosses between galaxies and extends throughout the universe. The finding provides the strongest observational support yet for what is known as the cold-flow model of galaxy formation. That model holds that in the early universe, relatively cool gas funneled down from the cosmic web directly into galaxies, fueling rapid star formation. A paper describing the finding and how CWI made it possible currently appears online and will be published in the August 13 print issue of the journal Nature. "This is the first smoking-gun evidence for how galaxies form," says Christopher Martin, professor of physics at Caltech, principal investigator on CWI, and lead author of the new paper. "Even as simulations and theoretical work have increasingly stressed the importance of cold flows, observational evidence of their role in galaxy formation has been lacking." The protogalactic disk the team has identified is about 400,000 light-years across—about four times larger in diameter than our Milky Way. It is situated in a system dominated by two quasars, the closest of which, UM287, is positioned so that its emission is beamed like a flashlight, helping to illuminate the cosmic web filament feeding gas into the spiraling protogalaxy. Last year, Sebastiano Cantalupo, then of UC Santa Cruz (now of ETH Zurich) and his colleagues published a paper, also in Nature, announcing the discovery of what they thought was a large filament next to UM287. The feature they observed was brighter than it should have been if indeed it was only a filament. It seemed that there must be something else there. 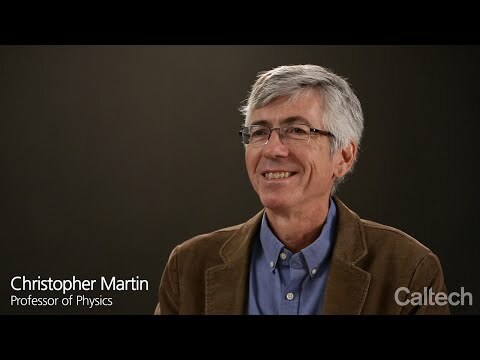 In September 2014, Martin and his colleagues, including Cantalupo, decided to follow up with observations of the system with CWI. As an integral field spectrograph, CWI allowed the team to collect images around UM287 at hundreds of different wavelengths simultaneously, revealing details of the system's composition, mass distribution, and velocity. Martin and his colleagues focused on a range of wavelengths around an emission line in the ultraviolet known as the Lyman-alpha line. That line, a fingerprint of atomic hydrogen gas, is commonly used by astronomers as a tracer of primordial matter. The researchers collected a series of spectral images that combined to form a multiwavelength map of a patch of sky around the two quasars. This data delineated areas where gas is emitting in the Lyman-alpha line, and indicated the velocities with which this gas is moving with respect to the center of the system. "The images plainly show that there is a rotating disk—you can see that one side is moving closer to us and the other is moving away. And you can also see that there's a filament that extends beyond the disk," Martin says. Their measurements indicate that the disk is rotating at a rate of about 400 kilometers per second, somewhat faster than the Milky Way's own rate of rotation. "The filament has a more or less constant velocity. It is basically funneling gas into the disk at a fixed rate," says Matt Matuszewski (PhD '12), an instrument scientist in Martin's group and coauthor on the paper. "Once the gas merges with the disk inside the dark-matter halo, it is pulled around by the rotating gas and dark matter in the halo." Dark matter is a form of matter that we cannot see that is believed to make up about 27 percent of the universe. Galaxies are thought to form within extended halos of dark matter. The new observations and measurements provide the first direct confirmation of the so-called cold-flow model of galaxy formation. Hotly debated since 2003, that model stands in contrast to the standard, older view of galaxy formation. The standard model said that when dark-matter halos collapse, they pull a great deal of normal matter in the form of gas along with them, heating it to extremely high temperatures. The gas then cools very slowly, providing a steady but slow supply of cold gas that can form stars in growing galaxies. That model seemed fine until 1996, when Chuck Steidel, Caltech's Lee A. DuBridge Professor of Astronomy, discovered a distant population of galaxies producing stars at a very high rate only two billion years after the Big Bang. The standard model cannot provide the prodigious fuel supply for these rapidly forming galaxies. The cold-flow model provided a potential solution. Theorists suggested that relatively cool gas, delivered by filaments of the cosmic web, streams directly into protogalaxies. There, it can quickly condense to form stars. Simulations show that as the gas falls in, it contains tremendous amounts of angular momentum, or spin, and forms extended rotating disks. "That's a direct prediction of the cold-flow model, and this is exactly what we see—an extended disk with lots of angular momentum that we can measure," says Martin. Phil Hopkins, assistant professor of theoretical astrophysics at Caltech, who was not involved in the study, finds the new discovery "very compelling." "As a proof that a protogalaxy connected to the cosmic web exists and that we can detect it, this is really exciting," he says. "Of course, now you want to know a million things about what the gas falling into galaxies is actually doing, so I'm sure there is going to be more follow up." Martin notes that the team has already identified two additional disks that appear to be receiving gas directly from filaments of the cosmic web in the same way. Additional Caltech authors on the paper, "A giant protogalactic disk linked to the cosmic web," are principal research scientist Patrick Morrissey, research scientist James D. Neill, and instrument scientist Anna Moore from the Caltech Optical Observatories. J. Xavier Prochaska of UC Santa Cruz and former Caltech graduate student Daphne Chang, who is deceased, are also coauthors. The Cosmic Web Imager was funded by grants from the National Science Foundation and Caltech. Using the Cosmic Web Imager at Palomar Observatory to study a system with two quasars 10 billion light years away, a team of astronomers led by Caltech has unveiled a giant swirling disk of gas—a protogalaxy, or galaxy in the making—being fed cool gas by a filament of the cosmic web. This picture combines a visible light image of the distant system with data from the Cosmic Web Imager (CWI). A filament of the cosmic web (outlined here with parallel curved lines) can be seen funneling cold gas onto the protogalaxy (outlined with an ellipse). The CWI is an integral field spectrograph; the researchers used it to create a multiwavelength map showing the velocities with which gas in the system is moving with respect to the center of the system. The red side of the disk is rotating away from us, while the blue side is rotating toward us. Gas within the filament is moving at a constant velocity that matches the blue side of the rotating disk.